“Mount Pleasant Winery’s Wine 101 Class” is an excellent way to enhance your appreciation for wine and those who make it! 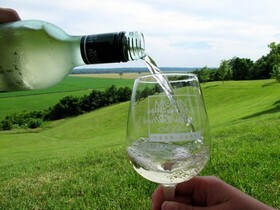 With a long history in the art of winemaking, “Mount Pleasant Winery” was established in the Augusta Appellation wine district of Missouri, the first such district established in the United States. The Branson winery features a wine shop, art gallery, and a hands-on opportunity to bottle your own dessert wine from a specially designed, 600 gallon French oak barrel. The “Mount Pleasant Winery’s Wine 101 Class” will teach you the five S’s of wine tasting like the pros: see, swirl, sniff, sip, and savor. You’ll also learn how to pair wine with a meal, as well as pairing it with the standard snack items everyone loves to have with wine - cheese and chocolate! You’ll get a complimentary souvenir wine glass, have the opportunity to browse the unique art galleries in the winery, and bottle your own wine. This one-hour educational experience will pay big dividends at your next dinner party; your guests will be so impressed! Find a little adult time in Branson, the destination of family entertainment, and have fun while learning a new skill at “Mount Pleasant Winery’s Wine 101 Class!” It’s a great experience for individuals, couples, and groups!